Kia Motors Europe has achieved a milestone for sales of cars bearing its industry-leading seven-year warranty, with three million cars now sold in Europe under the brand’s unrivalled quality promise. Kia first offered a seven-year powertrain warranty with the introduction of the first-generation Kia cee’d at the end of 2006, and launched a comprehensive ‘bumper-to-bumper’ seven-year warranty in 2010. Since 2010, the brand’s unique warranty has been available across the Kia model range, and is now sold as standard on every new Kia car in Europe. Since 2010, Kia estimates that its European customers have accumulated more than 158 billion kilometres at the wheel under warranty* – equivalent to more than four million circumnavigations of the Earth around the Equator. Kia’s comprehensive warranty covers defects in materials and workmanship for up to seven years or 100,000 miles. 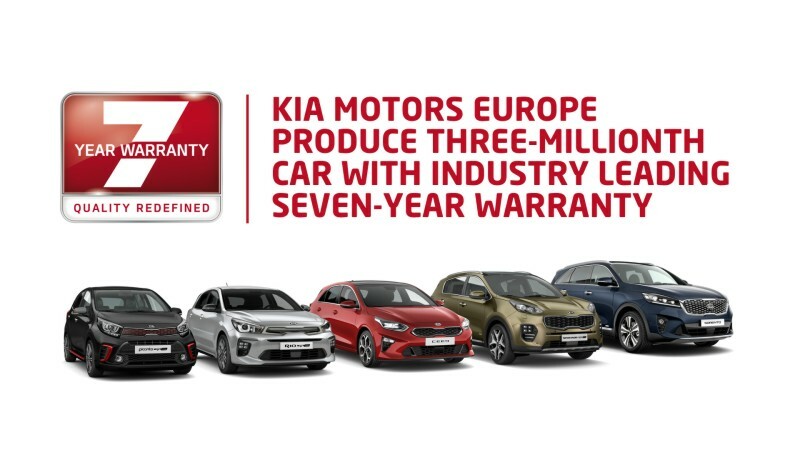 It remains the longest warranty offered by any car manufacturer in Europe, and provides customers with the peace of mind that comes from Kia’s high quality standards. The warranty is fully transferrable from one owner to the next. Kia backs up its comprehensive warranty and quality promise with exhaustive durability tests and high production standards for every model. Development vehicles cover millions of kilometres of testing before production, and cars are tested in extreme weather conditions, and on all road surfaces, in the Middle East, Europe, Asia and North and South America.